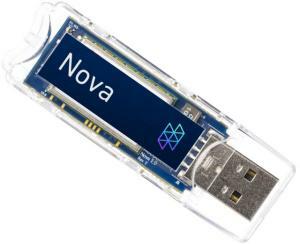 The Hologram Nova is a global cellular modem design for IoT developments, which bring us an easy-to-use, and completely open source cellular USB modem available in 2G/3G and 4G LTE Cat-M1 models. 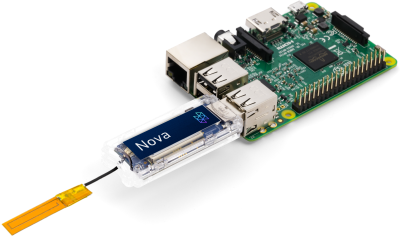 The Nova can be use with perfectly with a Raspberry Pi, BeagleBone and other single-board Linux computers. For detailed information related to the Hologram Nova, refer here. By following this guide you will be able to POST temperature data to Ubidots using the Hologram Nova connected in a Raspberry Pi in just a couple of minutes! 1. Activate the Hologram IoT SIM card. To activate your card, visit hologram.io/start . Once activated, insert the SIM at the back of the Nova. WARNING: Do not insert or remove the SIM while the Nova is plugged in - otherwise, you may damage or corrupt the SIM. 2. Based on your environment attach the antenna, if desired. The larger black antenna provides better reception, while the smaller yellow antenna has the benefit to fit of fitting inside protection cases. 3. If desired, insert the Nova into the transparent enclosure. Remember to insert the SIM and connect the antenna before enclosing the Nova. Note that this step is purely optional and will not affect functionality of the Nova. 4. Connect the Nova to the Raspberry Pi using the USB port. NOTE: The OneWire temperature sensor is sold with different versions containing resistors. Please see the "Wiring Setup" step of this guide to ensure the right connection of your sensor version. 2. Connect the Rasperry Pi to its power source and wait until it finish the boot properly. Reference to the table below for additional LED details. Every time the SIMCOM module sends a message over the cellular network, its first destination is the Hologram Cloud, but the message's journey doesn't have to end there! 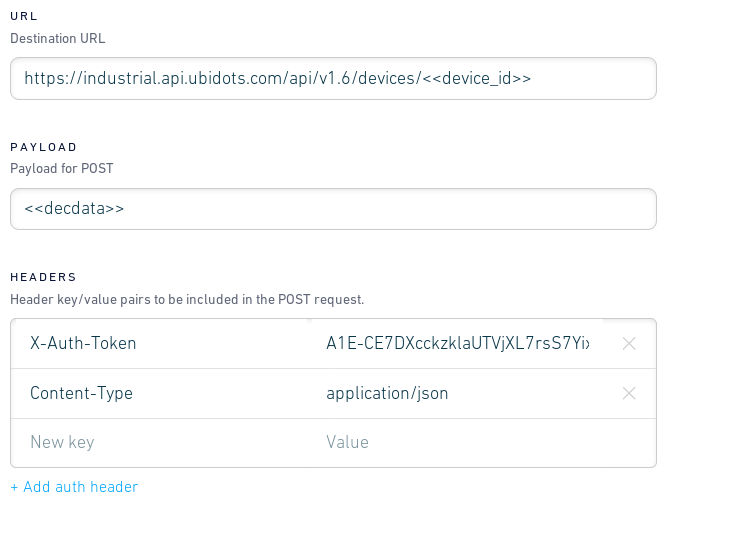 Using the Cloud Services Router (CSR) you can forward your data to Ubidots via HTTP(S) for data visualization and additional analytics for your IoT solution. Routes in the Hologram platform provide convenient methods to trigger actions (Data storage, Email, SMS, Webhooks, etc) by the presence or even absence of a device message’s topic. 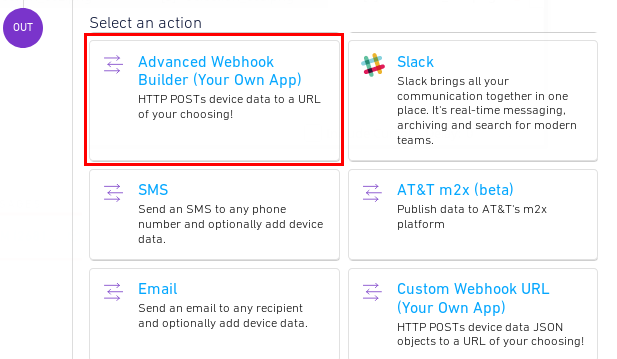 In this case, we're going to trigger a Webhook action to forward the module's messages to Ubidots for computation and display. 1. Go to the Routes section from the Hologram Dashboard and click the "+ New Route" button. NOTE: If you don't know how to find your Ubidots TOKEN, see the following guide. NOTE: To know more about the available variables to POST and the structures, see this guide. 1. Access to the Raspberry Pi terminal through SSH or directly from the Raspberry. feel free to choose the one you're most familiar with. 5. Verify Hologram's CLI (Command Line Interface) was installed. It will return a version greater than 0.6.0. 1. The Raspberry Pi comes equipped with a range of drivers for interfacing. In this tutorial, to be able to load the 1-Wire sensor's driver on the GPIO pins, we have to use the below two drivers. These drivers are therefore stored as loadable modules and the command modprobe is employed to boot them into the Linux kernel when required. 2. Now, we need to change the directory to our 1-Wire device folder and list the devices in order to ensure that our sensor has loaded correctly. Copy, paste, and execute the below commands in the pi's terminal by press "enter" after each one to run the commands. At this moment you sensor has already been assembled and connected and should be listed as a series of numbers and letters. In our case, the device is registered as 28-0000056915de , but your case will be a different series of letters and numbers, so replace your serial number with your own and run the command. This command will show you two lines of text with the output t= showing the temperature (in degrees Celsius). Please note that a decimal point should be placed after the the first two digits (this is provided in the final code- do not worry); for example, the temperature reading we've received is 25.875 degrees Celsius. 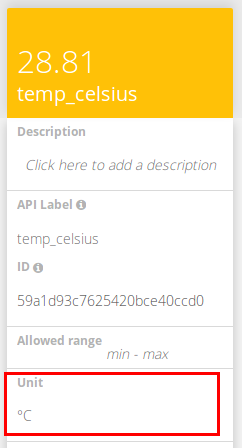 Now that you are able to see temperatures readings, it is time to post them to Ubidots! The following code sends a message with the Hologram cloud via Hologram Python SDK, using a modem to establish a cellular connection, and sends the messages to the Hologram Cloud which is relayed then to Ubidots. 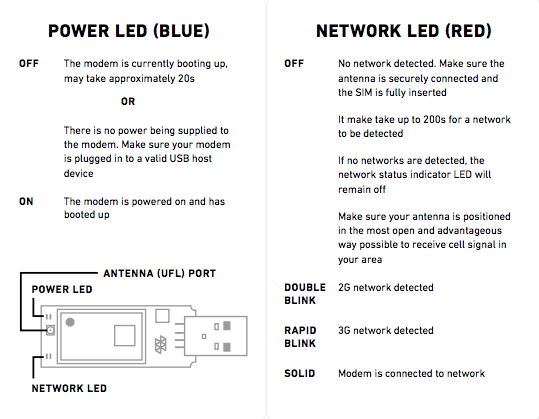 Once the message is received in the Hologram cloud the message will be routed to Ubidots if the route is correctly configured from Step 2 within this guide. Then, paste the below code to the Pi terminal and replace the serial number 28-00000830fa90 of the line temp_sensor = '/sys/bus/w1/devices/28-0000056915de/w1_slave' with your own serial number. As you can see on the image above the messages triggered are routed to the previous route created called "Ubidots Platform"
4. 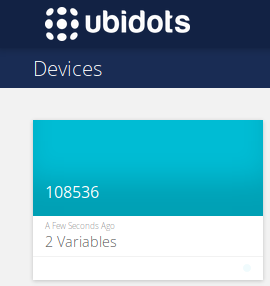 Go to your Ubidots account, and enter to the "Device" section to visualize the new device created with the Device ID from your Hologram Device. Inside the device you will find the temperatures values sent by the sensor connected via the Hologram webhook created. The names of the variables created are the same as the API labels, which are the IDs used by the API. This doesn't mean their names can't be changed, so it is recommended to change the names of your devices and variables to make them friendlier to your IoT solution's nomenclature. Click here to learn how to rename your device and variables names. As you can see below, we've assigned different units to the each variable and also assigned more friendly names to fit our projects nomenclature. This is highly recommended to users seeking deployments of 10+ devices. In just a few minutes you've built an easy DIY cellular temperature monitoring system using an Hologram Nova with a Raspberry Pi. Now its time to create Ubidots Dashboards to start tracking temperatures from your device and deploy your cellular connected monitoring solution with ease!